When you’re serious about getting your frag on, a solid gaming mouse is a make or break accessory. In a market that has been dominated by all stars like Razer and Logitech, Genius has some stiff competition. Today we take a look at their DeathTaker gaming mouse. We put it through its paces in the lab and find out how it compares to other mice out there. 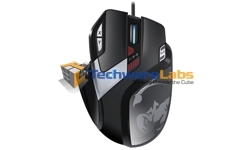 DeathTaker is a MMO/RTS professional gaming laser mouse for the GX gaming series from Genius. You can customize it to conquer any challenge in a MMO/RTS game and become an explosive game performer. DeathTaker has a built-in over-clocking SCGii engine for a dpi range from 100 to 5700 so gamers can easily shift around the battle field. A full speed CPU with memory chip prevents macro settings from game block and gives gamers 1-ms (8X quicker) in response time, plus a braided cable with gold-plated USB connector provides a stable and smooth signal connection during battle activities. A reliable eight million clicks gives a comfortable click feeling for MMO/RTS gamers, and the adjustable weight design has six metal weights – each 4.6 grams, and the X/Y axis dpi is adjustable to fit the game battle demand. DeathTaker uses the Scorpion UI so gamers can setup “Button Assignment”, “Manage Macro” for up to 55 keys, “Advance Setting” customized mouse performance and “Light Option” can select up to 16 million fascinating backlight colors. MMO/RTS game oriented, comfortable in design and a superb hand grip, outstanding performance in all games, DeathTaker is the choice of game addicts. Become a pro gamer now! Thats for the feedback on the error, we all make mistakes. It has been corrected. Enjoy the review. Some mice are meant for a claw grip, your hands nor American hands are particularly big. “I have largish hands, but no more so than the average American male”. Is this relevant? Does anybody know the size of the average American males hand? Interesting.